Out of the Dust joins the Scholastic Gold line, which features award-winning and beloved novels. Includes exclusive bonus content! "Dust piles up like snow across the prairie. . . ."
A terrible accident has transformed Billie Jo's life, scarring her inside and out. Her mother is gone. Her father can't talk about it. And the one thing that might make her feel better -- playing the piano -- is impossible with her wounded hands. To make matters worse, dust storms are devastating the family farm and all the farms nearby. 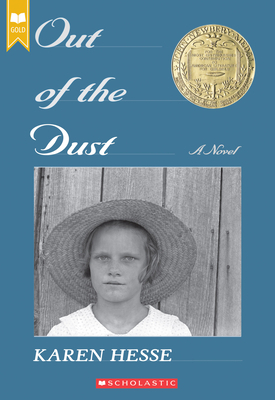 While others flee from the dust bowl, Billie Jo is left to find peace in the bleak landscape of Oklahoma -- and in the surprising landscape of her own heart. Karen Hesse is the award-winning and critically acclaimed author of many books for children. Her titles include Witness, The Cats in Krasinski Square, and the Newbery Medal winner Out of the Dust, among many others. She lives in Vermont with her husband and two teenaged daughters.